Tired of waking up to muezzin calls on loudspeakers in the middle of the night, Jews from Armon Hanatziv in Jerusalem mounted an aural counterattack. Armed with loudspeakers, they blasted the “Shema” incantation (from the 'Hear O Israel' prayer) in the direction of the Muslim Arab neighborhood of Tzur Baher. They reportedly did so at about 2:30 a.m.
Video of the Jewish counterattack garnered enthusiastic reactions on Facebook. Jews all over Israel find themselves routinely harassed by noise pollution from Muslim neighborhoods in recent years. This less-known “intifada” by Arabs involves fitting loudspeakers on minarets in mosques – which for centuries made do with unamplified muezzin calls for prayer. 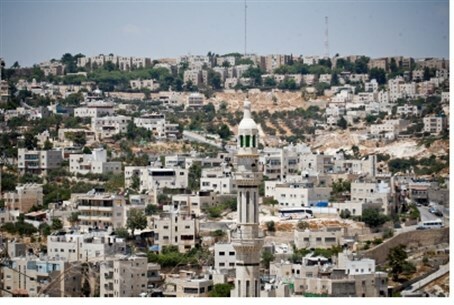 The Jerusalem Municipality reportedly embarked on a process to investigate and limit the noise pollution by local mosques, in January. According to the move, initiated by nationalist Councilman Aryeh King, the prayer call of 200 mosques in the eastern part of Jerusalem will be measured to see if the decibel level violates the law. King made the fight against Muslim noise pollution a priority when he was elected last November. At the time he stated "just like it's forbidden for us (Jews) to make loud noises after 12 at night it will be forbidden for them." 200,000 shekels have reportedly been allocated for the pilot program, in which the volume of the prayer calls emanating from two mosques in the south of the city will be measured. Mosques that disturb the public peace with their amplified prayer call will be put on a "black list" by the city. Mosques on the list will be ordered to turn their loudspeakers to face the center of the Arab neighborhoods and villages, to try and prevent disturbances to the rest of the city. If that step isn't enough, a technological solution will be installed to screen and reduce the noise dramatically.